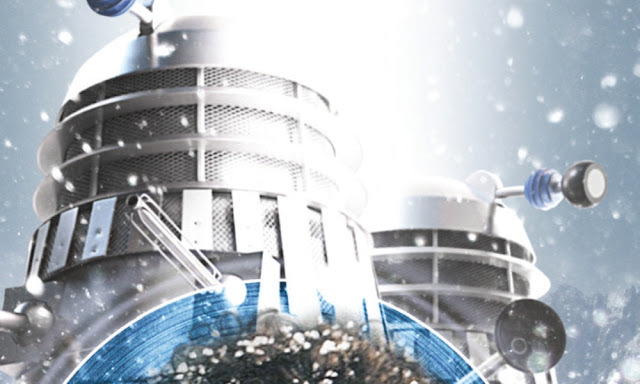 Much like the previous releases from this series of Fourth Doctor adventures, The Sands of Life and War Against the Laan, the story on these releases has been spread across two different stories, The Dalek Contract and The Final Phase. The first disc ends on a cliff-hanger but the second disc starts off exactly where we left off with no reprise whatsoever. Written by Nicholas Briggs, this story is surprisingly good. I was pleasantly surprised and proves that Briggs is better at writing stories that feature the Daleks rather than new or old monsters. Don't expect this story to break any new ground though, the only boxes ticked are Mary Tamm's Romana and K-9 finally get to meet the old enemies of the Time Lord and this story, although on audio format, feels like a classic 70's serial that could fit in somewhere between The Armageddon Factor and Destiny of the Daleks. Something that uplifts this tale is the inclusion of the villainous Cuthbert who I really enjoyed listening to in the previous stories he was in, The Sands of Life and War Against the Laan and he is somehow more convincing as a villain in this story than he was in the last two and David Warner obviously relishes the role he has been given. Towards the middle, he doesn't get a lot to do and it ends up with Romana asking what he is doing and Cuthbert responding saying its a secret. One does wish that they could give him more to do but this is a minor quibble in an otherwise good story. There are some good concepts in this story, in particular the Daleks being used as mercenary's, something I enjoyed, hearing the Daleks having to control themselves from killing, something they have been bred to do and it is a shame that they aren't given much time like this, there is an air of The Power of the Daleks and Victory of the Daleks, in this story. Like many of the Fourth Doctor audios, the supporting cast don't get a lot do, in fact, if you aren't Tom Baker, Mary Tamm, John Leeson, David Warner or Toby Hadoke, you don't have a lot to do in this story and might just as well not be in this at all. While these two stories will not break any new ground or rock your world, they are entertaining and defiantly a couple of the best stories from this series. Ultimately, this series is a tribute to Mary Tamm who passed away before this series was released in 2013 and while the end of the story promises more tales with this team, we know that this will never happen they will happen in our hearts. Well done Mary Tamm, you were wonderful. THE DALEK CONTRACT AND THE FINAL PHASE WRITTEN BY NICHOLAS BRIGGS AND STARRING TOM BAKER, MARY TAMM AND JOHN LEESON AS K-9 WERE RELEASED IN JUNE AND JULY 2013 RESPECTIVLY.